Vettel's number one status at Ferrari remains in doubt after his latest error at the Bahrain Grand Prix. The German lost control while challenging Lewis Hamilton for position - his fifth such error in the past 13 races. "It is just a phase Sebastian is going through," said Rosberg. "It is one that all sportspersons have to deal with - where things don't always go to plan," added the 2016 world champion, who won 23 grands prix and stood on the podium 57 times during his 10-year F1 career. 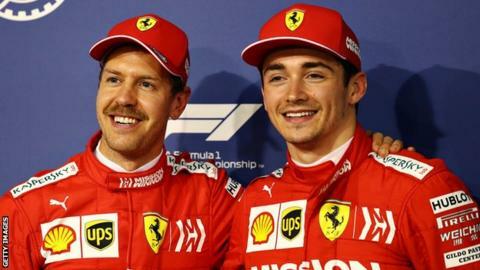 Vettel admitted he was "not happy" about a "difficult race" in Bahrain, when he was outpaced by team-mate Charles Leclerc in only his second race for Ferrari in his second F1 season. But Rosberg is confident Vettel will recover from his poor form. "You need to find your way out of that phase, and Sebastian is a four-time world champion so I am sure he will be able to manage that," he said. "He needs to get into a positive spiral again and all it takes in Formula 1 is one good race, so if he wins in China, then off he'll go." Vettel is currently fifth in the standings with 22 points. Leclerc is in fourth place with 26 points. Sunday's Chinese Grand Prix is the third race in the season.